Byron Bay holiday accommodation is already being reserved way ahead of the Mullum Music Festival being held from the 21st to the 24th of November this year. According to the Sydney Morning Herald, this smaller, almost boutique style event, is rated as one of the top five experiences that music lovers just shouldn’t miss. With over 120 performances taking place at 12 different venues over the four days, visitors to the area are making a weekend of it and not just attending one day of the Mullum Music Festival. Its a small wonder that all Byron Bay holiday accommodation providers are preparing to be fully booked for the entire weekend. Byron Bay offers a variety of different accommodation options from Broken Head camping and caravan sites to cabins and beach shacks. Broken Head camping and caravan sites are the ideal location for families as well as young music lovers who appreciate nature and are travelling on a budget. The camping grounds offer fully powered sites with the luxury of electricity as well as those that non-powered. In addition, full camping facilities are offered and barbecue facilities are available to cook your own meals. The Broken Head cabins are ideal for couples who are looking to turn their music festival visit into a more romantic getaway. The cabins are situated just off the beach providing the perfect backdrop for romance. Larger groups and families can reserve one of the Beach Shacks or the Holiday House for their stay. A kitchenette in each of these units provides a further alternative to cooking meals instead of eating out for every meal. While most Byron Bay holiday accommodation providers have either restaurants or self-catering options available, it is recommended to eat out at one of the many dining establishments in the area at least once. The cuisine at most of the restaurants and pubs will tantalize your taste buds and keep you coming back for more. Food and drinks will also be available at the various music venues. There is plenty to do while staying in your Byron Bay holiday accommodation. Take the time to explore one of the beaches or nature reserves and discover the amazing scenery surrounding Byron Bay. 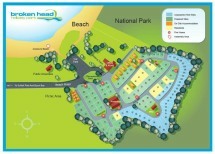 The Broken Head camping grounds are ideal as this holiday park is not only set just off the beach but borders a nature reserve. Be sure to get your reservation in early as the camping sites, cabins and beach shacks will be snapped up fast for the Mullum Music Festival.